PIRATE RADIO – Crime Against The State’ Ronan O’Rahilly to Royce Harper. Hey Pop Pickers! A tasty history with a glut of jingles, audio, video and accompanying monologue for your audio-visual pleasure. The belfast fringe festival presents premiere of a new kids’ and family circus-theatre show – SUPERGIRLACTICA. It is a fantastical tale of two girls who fly off to another world in search of adventure, fun and imagination. Suitable for all ages, particularly 4-8 yrs. 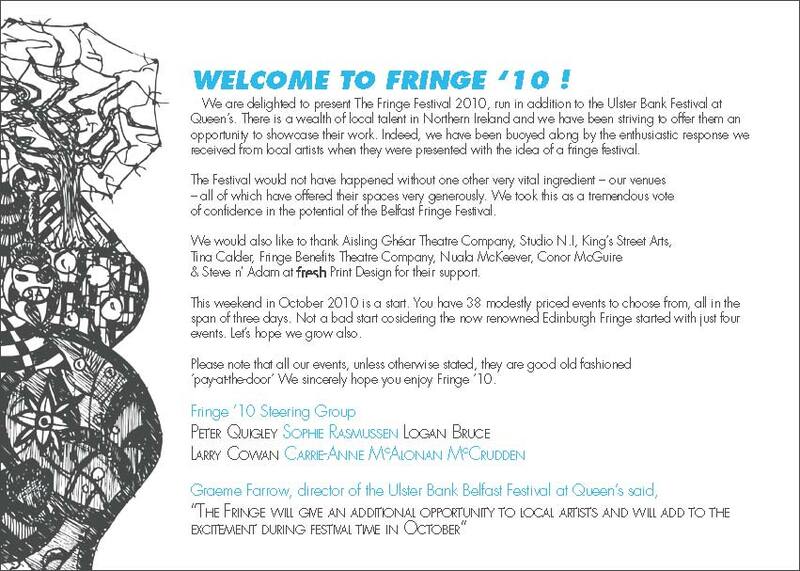 Belfast Fringe Festival 2010: Lorcan McGrane – Geekdom · Safehouse Art Gallery · Belfast · What’s On NI. via Fringe Festival for ‘hard times’ is about to hit Belfast. – Northern Ireland, Local.